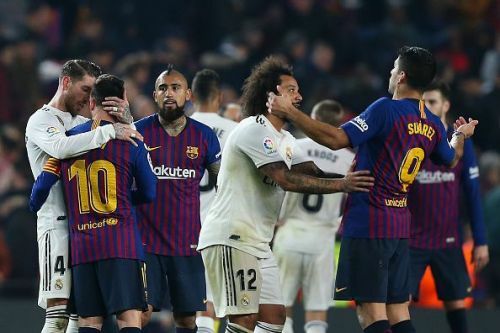 There are countless derbies happening over the course of a calendar year, but nothing matches the grandeur and competitiveness of the El Clasico. The most celebrated and awaited derby in every season of football, the two eternal rivals - Real Madrid and Barcelona going head to head is an event the world awaits. The fans from the coastal Barcelona to the Spanish capital of Madrid.resonate with zeal and energy. This season the story about the Clasico has been a lot different with the contest being deprived of the head-to-head clash between the two greats of the game - Cristiano Ronaldo and Lionel Messi. Ronaldo's move to Juventus from Real Madrid last summer has contributed to a decline in Real's attacking force. However, the Los Blancos have been able to hold their fort well after the departure of the man who led them to multiple titles in his tenure of wearing the legendary white jersey. This was evident in the last Clasico that took place almost three weeks back at the Camp Nou. The two teams had to settle for a tie with a goal apiece from each team. The double Clasico week is already on as both teams prepare to take on their formidable opponents twice in four days. The legendary Santiago Bernabeu, in the heart of Madrid, is going to be the battlefield as the two superclubs fight for supremacy. The first match will decide the team that will progress into the final of the Copa del Rey. The following match will go a long way in deciding who will win the La Liga. Barcelona could stamp their authority and widen the gap between them and second-placed Atletico Madrid. On the other hand, Real could cut down the deficit to nine points, with a game in hand.